Of all the waterfalls i visited that day, this was my favourite. The gentle curve on the falls made for a great image. Exposure was a little challenging – in reality the rocks and foliage on the right were in deep shadow and I was in danger of having them severely underexposed, so I had to add a three stop soft graduated ND filter, angled with the darkest part of the filter top left. This did a great job of evening out the exposure. If those rocks in the foreground looked slippery, that’s because they were. If you are ever photographing in this area, take great care. Have a camera rain cover with you – you will need one. I use the Opteka cover – cheap but effective. Lens cloths – pack every lens cloth you have. Spray gets everywhere. The camera rain cover will obviously leave the lens exposed, and you will accumulate water droplets at a frightening rate. You’ll have probably driven many miles to get to this area, don’t lose an image. Following on from the above, check the lens before every image. Even if you only have one water droplet on your lens, it seems to invariably sit right where it’s most noticeable! 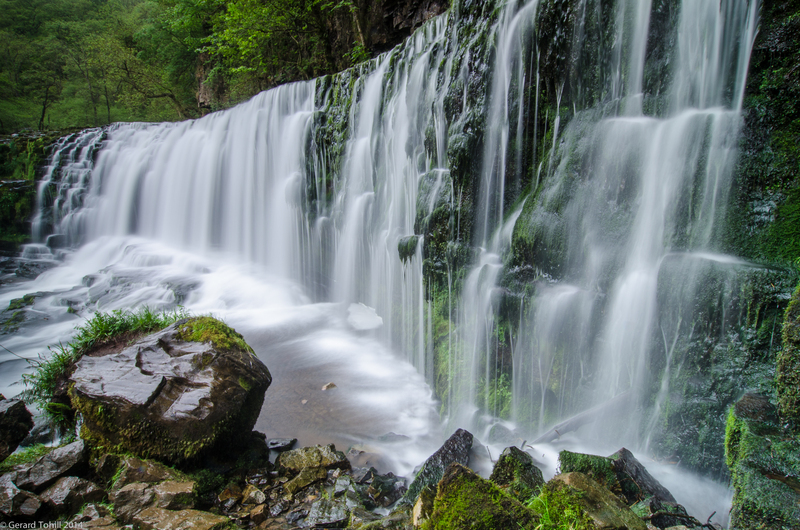 It is incredibly slippery underfoot – take care near the falls. Get there early. These places are very popular, and justifiably so. If you’re looking for some peaceful images, an early start is essential. Photography stuff: 12-24mm lens at 12mm, 5 seconds at f/22, 3 stop graduated ND soft, tripod, remote release. Now, more importantly…how do we say this? You gave excellent tips, thank you! Gorgeous falls. You did well with this. Thank you Laura – appreciated! The perspective helps, but I was lucky because there had been rain beforehand meaning there was more water than usual. Rain. What’s that?? lol It really is a beautiful capture and nice work too! lol! Can you just send some over here please???? ?